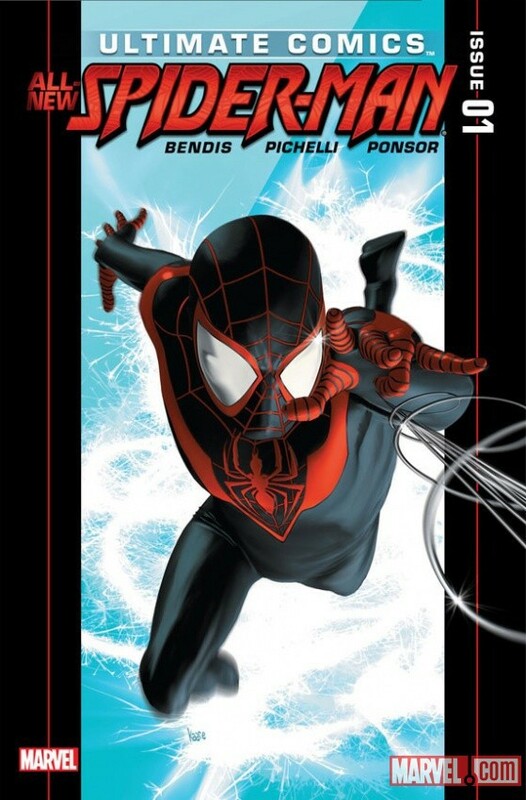 It's been a crazy week, kids, and it's only gotten crazier with yesterday's announcement that half-black, half-Hispanic teen Miles Morales will become Marvel's new Ultimate Spider-Man in this week's Ultimate Fallout #4 by Brian Michael Bendis & Sara Pichelli. I figured I'd touch on the hubbub and make a point that dovetails, ever so lightly, with my articles on continuity (the second of which, no kidding, is coming really soon). New costume. New Spider-Man. 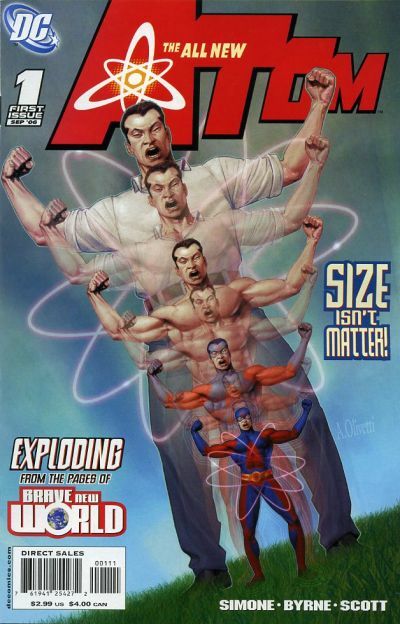 Art by Kaare Andrews. So, there's a new Spider-Man, and in a move apparently inspired by African-American comedian Donald Glover's desire to land the role of Peter Parker in next summer's Amazing Spider-Man film, he belongs to a racial minority. With this move, Marvel makes Spidey the next in a long line of superheroes who've been "replaced" by a minority character. This practice has been more common in DC Comics of late, with co-publisher Dan DiDio having launched an aggressive campaign to add diversity to their line-up of super-heroes. Looking at the trend of "replacing"--always temporarily--major super-heroes with minority characters, I thought it interesting to be able to tie the concept back to something I worked on, years ago, back in film class! Y'see, once upon a time I took a class in colonialism in cinema, and the paper I worked on for my final was a dissection of the Blaxploitation genre. I introduced this concept of the "License of Power," in which I put forth the idea that the blacks in these films weren't really as in control of their destinies as the filmmakers would have one believe. Rather, the colonial relationship--which is essentially between master and subject/slave--was left intact, consciously or subconsciously, with power firmly resting in the hands of whites. 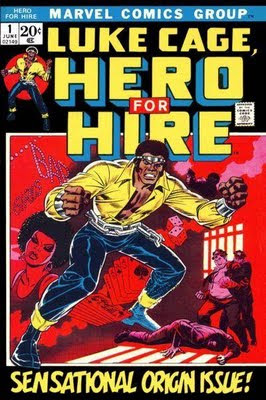 Fresh from the 70s Blaxploitation craze, and still Marvel's most popular black hero. To drive a narrative forward, to be the "hero," blacks were licensed a measure of power that made them capable of accomplishing their tasks within the narrative. The implicit license transferred the whites' power onto the black protagonists (and sometimes antagonists), with the implication that without white interference, the blacks would be unable to succeed. The other side of the coin was that the "license of power" was not indefinite and did have particular conditions. If the licensee didn't follow through on the assigned task(s), or if he exceeds his authority, then the white men who have granted him such power were obligated to strip the character of it. I went through a number of examples in the Blaxploitation genre to prove my argument, using films like Mandingo, Blacula, Shaft and Black Caesar. (In the end, I did get an "A" on the paper, so I suppose my claims have a degree of merit.) Which, of course, brings me to the License of Power as it applies to superheroics. There is a dearth of truly original minority super-heroes in comics. Obviously Luke Cage, Storm and Black Panther come to mind at Marvel, while Black Lightning, Bronze Tiger and Vixen are solid if not particularly well-known examples at DC. While it's grown difficult for new characters to gain a foothold in the comics market, it's even more daunting for an original minority hero to find that niche. Since the sixties, it's become a common trope for the Big Two to develop a new minority hero by introducing them in the mold of an established white one. In all the below cases, the "license" idea refers chiefly to the passing of the tights. 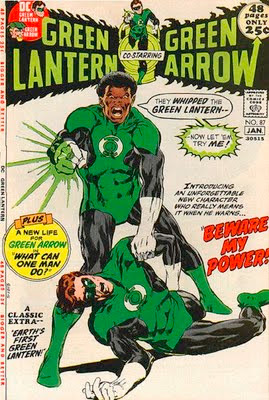 John Stewart, forerunner of the minority replacement heroes. Art by Neal Adams. John Stewart: Introduced in 1972's Green Lantern #87, Stewart wasn't even the first alternate selected to be the Green Lantern of Sector 2814. He was only selected when Guy Gardner was comatose with brain damage. He was often a "substitute" Green Lantern during the late seventies, and stepped up to be the sector's only Green Lantern when Hal Jordan briefly quit in the early eighties. Hal Jordan has struck him down as Green Lantern, most notably when Hal as Parallax put an end to his life as the first human Guardian when he destroyed Oa's Central Power Battery. Interestingly, he's the Green Lantern the public finds most familiar, due to his appearance in Cartoon Network's Justice League Unlimited animated series. Bill Foster: Originally a lab assistant to Dr. Henry Pym, Dr. Bill Foster assumed the identity of Black Goliath in the seventies, using Pym's growth formula while Pym himself enjoyed a career as Yellowjacket in the Avengers. Later, he took yet another of Pym's noms du guerre, Giant Man. Much later, he surrendered the Giant Man name and powers to Pym, but eventually returned only to be killed during Marvel's Civil War. Jim Rhodes: Introduced in 1979 as billionaire industrialist Tony Stark's pilot, Rhodey didn't take the spotlight until 1983. Denny O'Neil and Luke McDonnell took Stark out of the Iron Man armor, having relapsed into alcoholism, and gave the armor to him. Rhodey wore the armor for over two years, until Tony actually fought his friend and diagnosed him with a physiological condition over wearing armor not meant for him. Afterward he rarely wore the suit, but upon Stark's "death" a few years later he donned the "War Machine" armor, which he's done off and on for years, mostly at Stark's discretion, often clashing with his boss and friend and even losing the armor. 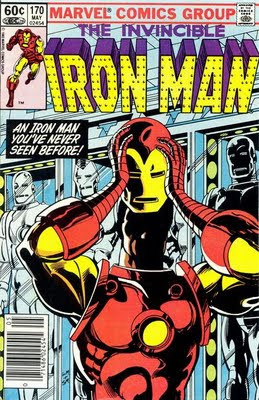 (Stark never had an alien armor bail him out of a jam!) He currently moonlights as "Iron Man 2.0." Rhodey takes center stage as the new Iron Man. Art by Luke McDonnell. Isaiah Bradley: In the revisionist era of the early 2000s, African-American creator Kyle Baker posited that after Steve Rogers was given the Super-Soldier Serum that made him into Captain America, the U.S. government tried to duplicate the lost serum by experimenting on black men. The storyline evoked similarities to the Tuskegee Syphilis Study, and Isaiah Bradley was its biggest success, first becoming superhumanly powered (the "Black Captain America") but eventually falling victim to ill effects that left him incapacitated in his later years. Eventually Rogers learned of his existence and sought reconciliation, feeling guilt for what had happened to Isaiah. Jason Rusch: Ron Raymond, a.k.a. Firestorm, floundered from series to series after DC canceled his own long-running title in 1990. What else could DC do but relaunch the character with a new secret identity? While they wisely reinstated the dual personality that marked the Firestorm entity since his creation in 1978, it nonetheless remains expressly clear that Jason originally received his power as direct result of Raymond's death during Identity Crisis. And when Ron returned in Blackest Night, DC quickly relegated Jason to the voice in his head, going the way of his predecessor, Martin Stein. Ryan Choi, Asian replacement for Ray Palmer, the Atom. Art by Ariel Olivetti. Ryan Choi: DC introduced the Chinese scientist specifically to add even more color to its diversifying line in the wake of Infinite Crisis. Created by Grant Morrison and Gail Simone, Dr. Choi was a previously unknown protege of the previous Atom, Ray Palmer, and took over the role when Palmer went conveniently went missing during the earlier Identity Crisis. He not only became the Atom, but he also took Palmer's place on the staff of Ivy University. Jaime Reyes: Also spinning out of the end of Infinite Crisis was this Hispanic variant on the Blue Beetle character, picking up where previous versions Dan Garrett and then-recently-deceased Ted Kord left off. The source of his powers was the same magical scarab used by Garrett, the first Beetle. He has had a three-year run in his own title, followed by a regular second feature in Booster Gold, becoming his partner in the same way as Ted Kord was before him in the Justice League International. Tyrone Cash: The Ultimate Marvel universe had one previous flirtation with changing races in Dr. Leonard Williams, the retconned-in "First Hulk." 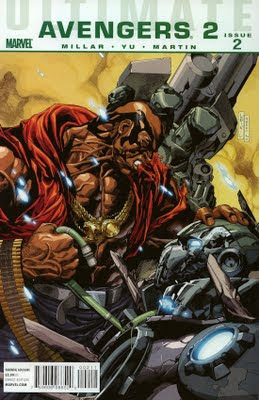 Introduced in Ultimate Comics Avengers by Mark Millar and Leinil Yu, Williams worked with Banner on the Hulk experiment, and became a Hulk that kept his intelligence and used his smarts to fake his death and set himself up as a gang lord in South America, surrounded by gangstas and hoes, embodying the very worst of the "Black Buck" stereotype. He also took the place of the "real" Hulk for a time. They say this cat Hulk is a baaaad motha'--shut yo'mouth! Art by Leinil Yu. "Thunderbolt" Ross: Only a minority in the sense of his age group (originally to have been nearly 70 if older stories were judge, but edited to be in his 50s), Ross became a Hulk oddly similar to his predecessor, a sharp counterpoint to all previous gamma-enhanced individuals. Since being defeated by the Hulk, he keeps his power under writer Jeff Parker so long as Banner and Captain America deem it appropriate (i.e. as long as sales don't falter). Finally, we come to Miles Morales, the alliteratively-named (just like Peter!) new Spider-Man. Unlike the majority of the previously-named characters, because it's the Ultimate Marvel universe and not the regular one, this change has a chance of sticking a bit longer than the rest. Indeed, he stands the chance of disproving the tried-and-true colonialist view of replacement heroes, in an in-story if not a meta context. Will the grand experiment succeed? You decide! Miles Morales is a member of one of the fastest-growing minority classes (which will, we're told, become a sizable majority in the U.S. sometime later this century if trends continue). Besides that, we really don't know anything about the new Spider-Man; he's a blank slate and will continue to have only the barest hint of characterization until the new volume of Ultimate Comics Spider-Man arrives in comic shops in September. Although it will be interesting to see someone other than Peter Parker behind the mask for a change (Ben Reilly doesn't count, and Hobie Brown did it for all of five seconds), I can't help but feel Marvel's energies would have been better spent introducing the "next great character in the Ultimate Marvel firmament" who happens to belong to a minority, instead of just promulgating the next in a line of seemingly endless iterations of their number one hero. It's a publicity stunt either way, right? What would have been better than having several new heroes--white, black, Hispanic, Indian, Asian, whatever--trying to live up to the legend begun by Spider-Man, a young kid who could have been any one of them behind that mask that didn't give a hint to the identity or race of the person behind it? Imagine the development of several original characters inspired by Spidey, all under the event umbrella, "The Hero Who Could Be You!" 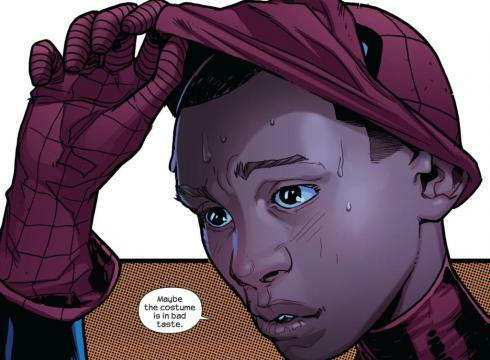 Maybe young Miles Morales is right. Art by Sara Pichelli. Ah, but there we go, again. The last Marvel "hero" of any sort to really resonate with so-called fans is Deadpool, created in 1991. 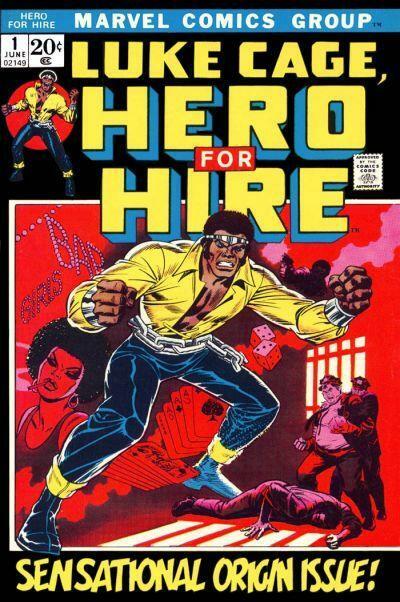 And the last minority character to really strike a chord was Luke Cage, created in 1972. (Does Bishop count? Where is he now, anyway?) And neither is really in the public eye--that honor belongs to Samuel L. Jackson as Nick Fury, and don't get me started on him. Perhaps it's better to endlessly regurgitate the old stuff in new ways--and in this case, the same tired colonialist tropes--simply because it's better to take small chances like changing a beloved character's ethnicity than take a bigger chance like trying to do something truly new, interesting, and perhaps, just perhaps, original. Give us some heroes, Marvel. Don't give us a bunch of musical masks. Excellent article as always. I agree that it's a poor publicity stunt in the grand scheme but if it allows for kids from other backgrounds to bond with a superhero, maybe it's okay. A friend of mine pointed out how the fact that no one could see what Spider-Man looked like under his mask made him approachable by anyone, no matter their background or skin color.